Categories: water | Tags: alkalinity, dehydration, energy, flouride, fluoride, hydration, kidney, skin, water, weight-loss | Permalink. Although most of our bodies are made of water, we still need a lot of it to survive on a daily basis. You probably have heard the story that you have to drink eight glasses (or more) of water per day in order to stay hydrated. This is partly true if you do not take water in any other forms. In fact, 20% of your daily water intake comes from solid food, mostly fruits and vegetables. That’s why you should “eat your water” instead. Water maintains homeostasis in our bodies and it is of utmost importance that we stay hydrated. Water deficiency is called dehydration and can cause serious headaches, confusion, appetite loss, excessive tiredness and even seizures. It is also bad for you to consume water in excess. You might experience nausea, vomiting, or muscle cramps. Cucumber is many people’s summer favorite veggie. It contains the most water of any solid food and you may use it sliced in salads or with hummus. There are also many recipes on how to get hydrated with cucumber. You can try to blend it with mint, nonfat yogurt, and ice cubes to get a good chilled soup for the hot summer days, or at any time of the year. Although not so popular among health experts, this vegetable is full of water. It is not a favorite one because of other green vegetables such as romaine lettuce or spinach, which contain a lot more fiber than iceberg lettuce. However, if you want to get hydrated, this crispy lettuce is the best choice because of the high amount of water. You can use it for making sandwiches, as a tacos wrap, or in burgers. You must have heard the popular saying that celery has negative calories, but let’s see what you are up for with this vegetable. It is a fact that celery comes with only 6 calories in one stalk and it is also full of fiber. In terms of its nutritional value, it contains folate as well as many vitamins, including A, C, and K. Celery can help in neutralizing stomach acid and relieve heartburn or reflux. If you are a fan of a mixture of spicy and sweet taste in your spring and summer salads, radishes can brighten up your day and give you a new colorful meal. These vegetables are full of antioxidants including catechin (which can also be found in green tea). If you would like a crunchy hydration recipe, mix radishes with summer coleslaw, slicing them up with cabbage and carrots, sliced snow peas, and chopped parsley and hazelnuts. Then use poppy seeds, olive oil, lemon juice and add salt and pepper. Enjoy this beautiful mixture! These vegetables are mostly used for making salads and sandwiches, but it is important to use all of the varieties, including sweet cherry and grape ones, which will help you in the hydration process. You can also mix them with nuts as a snack or some cheese low in sodium. One idea of a recipe is the following: skewer some grape tomatoes, mozzarella cheese and basil leaves on toothpicks as appetizers or snacks. These types of bell peppers have the highest amount of water and contain many antioxidants as the other types of peppers, such as the red and sweet ones. Peppers are great to use as a snack when you have a craving, instead of falling for something sweet and unhealthy. Plus, you will get hydrated and feel refreshed. This white flower-looking vegetable is full of vitamins and phytonutrients that help in fighting cancer, including breast cancer, and lowering cholesterol. Cauliflower is best used in your favorite salad, in order to make it crunchy and get hydrated. Spinach is both green and full of water – a really healthy treat for your body. You can put it in your sandwiches or salads and enjoy its taste. Spinach is not only hydrating but also rich in lutein, fiber, potassium, and brain-boosting folate. One cup raw leaves of spinach can satisfy your daily intake of vitamin E, which is a powerful antioxidant that fights free radicals (damaging molecules). Water is as important as oxygen to lead a healthy life. Your body cannot function properly without enough water, which comprises 60 percent of your body weight. Water plays many crucial roles in the body, from detoxification to absorption of nutrients. 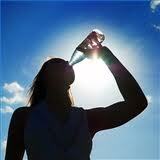 Health experts recommend drinking water throughout the day to keep the body hydrated. However, water is not the only way to keep the body hydrated. Eating more water-rich fruits has other health benefits, too. Such fruits are low in calories and help with weight loss. They are rich in minerals, vitamins, antioxidants and fiber that are important for good health. Water-rich fruits also help flush waste and toxins out of the body. Aim to eat water-rich fruits with about 85 percent or higher water content. You can eat the fruits raw, or make smoothies or juices. Eat 2 cups of fruits per day to provide your body with fluids. Watermelon is one of the most water-rich fruits you can eat. It contains essential rehydration salts – calcium, magnesium, potassium and sodium – that help keep the body hydrated and largely reduce the chance of dehydration. According to a 2009 study by University of Aberdeen Medical School researchers, watermelon helps hydrate the body twice as effectively as a glass of water after an intense workout. In addition, watermelon is a good source of vitamins A and C, beta-carotene and lycopene, which keep your body fit and healthy. Lycopene also protects the body from ultraviolet (UV) light. You can eat watermelon as it is, or add it to your fruit salads and smoothies. You can even keep a water pitcher in the refrigerator with watermelon cubes in the bottom. All berries are good foods for hydration, but strawberries are the best with 92 percent water. They also contain vitamin C, potassium, fiber and folic acid. The fiber in strawberries has a satiating effect, keeping you feeling full so you do not indulge in unnecessary snacking. In addition, these berries are a sodium-free, fat-free, cholesterol-free, low-calorie food. Strawberries offer a wide range of health benefits, from anti-aging effects to supporting cardiovascular health. Adults as well as children like their sweet, slightly tart flavor. Eat a handful of ripe strawberries daily as a healthy snack. You can also blend a few strawberries in your favorite smoothie. In addition to strawberries, cranberries, blueberries and raspberries also have a high water content. This juicy, tangy fruit is also one of the most hydrating fruits with 91 percent water content. Grapefruit also contains important electrolytes that help prevent dehydration. It is high in soluble fiber and vitamin C, and contains smaller amounts of vitamins A, B-complex, E and K. It also has calcium, folate, phosphorus, potassium and several phytonutrients. Regular intake of grapefruit can lower your insulin level, help control your appetite, protect against the common cold, aid in weight loss, make your skin beautiful and lots more. Try eating half a grapefruit at breakfast or drink a glass of freshly squeezed grapefruit juice daily. Note: This fruit may interact with certain medications like blood pressure medications and may not be suitable for women with hormone sensitive conditions. Cantaloupe, also known as muskmelon or mush melon, is another high water content fruit with 90 percent water. Cantaloupe also contains potassium, an important electrolyte that can be lost during sweating and cause dehydration. Other vital nutrients found in cantaloupe are vitamins A, C and K, protein, fiber, folate, calcium and iron. Regular intake of cantaloupe reduces the risk of obesity, diabetes and heart disease, while promoting healthy skin and hair. It also provides protection against a range of diseases and conditions from the common cold to cancer. You can add some ice to fresh-squeezed cantaloupe juice for a refreshing drink in the summer. You can also use cantaloupe to make delicious cold soup or tasty smoothies. Peaches contain about 88 percent water content, making them a great solution to beat dehydration. Fresh peaches are juicy and taste great. They are a rich source of vitamins, minerals, antioxidants and various other chemical contents. Peaches contain vitamins A, C and K as well as fiber, potassium, folate, iron, magnesium, phosphorus, and manganese. At the same time, they are low in calories and contain no saturated fats. Peaches help fight obesity and prevent related diseases like diabetes, metabolic syndrome and cardiovascular disease. You can muddle ripe peaches into your glass of lemonade, iced tea or water to make a refreshing drink. Another option is to add sliced peaches to your oatmeal, yogurt and cold cereals. Pineapple is another fruit with high water content. It has 87 percent water. It is a powerhouse of nutrients, such as vitamins A and C, thiamin, calcium, potassium, phosphorus, manganese, folate and fiber. Pineapple also contains a proteolytic enzyme called bromelain that has many health benefits. Additionally, it is low in sodium and fat. This fruit is both juicy and fleshy that helps keep your body hydrated and cleanses your body to get rid of harmful toxins. Moreover, pineapple boosts your immune system, improves digestion, promotes eye health and makes your bones strong. You can have fresh pineapple juice or make yummy pineapple popsicles during the hot summer. You can also enjoy it as a fruit snack or add it to fruit salad, stir-fry and soups. Categories: fruit, vegetables, water | Tags: dehydration, diet, fruit, hydration, vegetables, water | Permalink. If a tall, cold glass of water is not really your thing, hitting your daily water needs can seem out of reach. Here are some healthy ways to stay hydrated, even if you don’t like plain old water. Whenever I write about staying hydrated, I hear from folks who just don’t like water. And honestly, plain water is not my favorite thing either. If I’m very thirsty, I crave a glass of water, but it’s hard to get jazzed about water on a regular day. The trick with drinking more fluids is that you don’t want to add a bunch of sugary drinks, like soda and juice, to your daily routine. Drinking your calories is bad news for maintaining a healthy body weight, and excess sugar is linked to chronic disease and even depression. The good news is that there are ways to stay hydrated without drinking glass after glass of plain water or resorting to sugary drinks. These are some of my favorite healthy, hydrating tricks. At a recent nutrition conference I attended, one of the doctors said that if you eat a lot of fruit and veggies, you don’t end up needing to drink as much, because you’re actually eating your water. A 2013 study found that eating more fruits and vegetables can make you significantly more hydrated without upping the water you’re drinking at all. Choose fruits and veggies with high water content, like melons, strawberries, lettuce, celery and cabbage. Check out this chart, which breaks out food and drink by their percentage of water content. No, a mimosa is not a healthy, hydrating drink, but sparkling water can help you hit your water mark. Soda water or seltzer sometimes get a bad rep, but most experts agree that they’re just as hydrating as water. The biggest myth about carbonated water is that it leaches calcium from your bones. This is not true. Drinking lots of soda is linked to lower bone density, but the bubbles are not to blame. Excessive sugar consumption (like from drinking lots of sweet sodas), on the other hand, does have links to osteoporosis. Maybe this is where that myth got started. Skip the artificially sweetened, colored and flavored drink packets, and flavor your own water at home. To make your own flavored water, just squeeze in some fresh lemon or lime juice or float cut fruit or herbs in your glass. It’s visually appealing and a lot healthier than a super sweet soda or artificially flavored drink. Plus, you end up with a little snack at the bottom of your glass! I like to use this trick with flat or sparkling water, so try each and see which one you like best! Try some of my Fruity Fizz combos to get you started. Pro tip: frozen fruit pieces actually work best here, because they release more flavor as they thaw. Whether you drink it hot or iced, unsweet tea gives you a nice flavor boost with no added sugars. Different teas each come with their own health benefits, so you get a healthy double whammy when you choose unsweetened teas. If you’re a sweet tea or soda drinker now, going straight to unsweet tea is not going to be pleasant. I’d recommend making a gradual switch so your palate has time to adapt. Start with 3/4 the amount of sugar for a week, then go to 1/2 the amount, then 1/4. From there, you should be able to cut out the sugar without missing it too much. It will be an adjustment, but it’s so worth it for your health! The tips above are for drinks to add to your daily routine, but I think that juice deserves its own mention, because it gets a lot more healthy cred than I feel it deserves. Drinking more sweet juices is not doing your body any favors. Sweet juices like apple, orange and grapefruit are basically uncarbonated soda. Even juices without added sugars contain high levels of fructose without any of the fiber that makes fruit healthy. There are some exceptions when it comes to juices. Not all juice is high in sugar. Lemon, lime, unsweetened cranberry and most vegetable juices are not going to add a lot of sugar to your diet. A splash of unsweetened cranberry in water or seltzer is one of my favorite everyday drinks, and it’s very low in sugar. If you’re not sure whether the juice you’re drinking is high in sugar, look at the nutrition label. Many popular juices contain as much sugar as soda. Apple juice, for example, has 24 grams of sugar per eight ounce serving. Eight ounces of Coca Cola contains 26 grams. Categories: water | Tags: dehydration, fluids, fruit, hydration, juices, soda, tea, water | Permalink. Exercising and spending more time outdoors in the summer can leave you sweaty, hot and thirsty. And while it’s best not to wait till you actually feel that thirst to grab a drink, going back to the same water bottle can be a bit uninspiring. “As a healthy eating dietitian, I probably shouldn’t say this. But water can get boring. You need to figure out ways to jazz it up,” said Desiree Nielsen, a registered dietitian in Vancouver, B.C. She added there are easy ways to make plain old water more appealing. Balance out the dehydrating beverages with extra water. Choose fruits and vegetables with high water content. Make yourself a custom blend of iced herbal tea with lots of ice. If you get too thirsty, your body may misinterpret signs of thirst for being hungry which will prompt you to eat. But if you’re not eating the right things, you won’t quench that thirst. Nielsen says you can do simple things like blend watermelon and serve it as a drink. Or if you’re trying to keep kids hydrated, serve them a homemade dessert. Brian St. Pierre of Augusta, Maine, is a sports dietitian and nutrition educator with Precision Nutrition. He says exercising in the summer is different than in the winter because we sweat a lot more. For elite athletes, he recommended sports drinks to replace lost electrolytes like sodium, potassium and magnesium that your body needs for your muscles and heart to function properly. St. Pierre said considering the amount of food colouring in sports drinks, while not ideal, the rehydrating benefits outweigh the risk. And adds that high level athletes can burn the sugar added to those sports drinks. But before you celebrate a brisk walk from the parking lot to the office with a bottle of brightly coloured electrolyte liquid, St. Pierre said you might want to reconsider. “For most people, water is more than enough for regular hydration, water’s your best friend,” he said. “If you’re really in the heat, if you’re playing a full 18 holes and you want to make sure you’re not getting dehydrated, having something like a G2, a lower carb option. Nutritionist Julie Daniluk also suggests you skip the sports drinks, but for a different reason. “My concern is some of the additives they put in there,” she said. Her recommendation, one echoed by Nielsen, was to opt for coconut water for its high levels of magnesium and potassium. She also suggested herbal teas, to get minerals into your body without including the sugar in commercially brewed iced tea, or to make lemonade with a pinch of unrefined sea salt. For Daniluk too, it’s all about keeping the flavours interesting. But most people don’t spend all their time under a patio umbrella sipping pure water or naturally sweetened herbal tea. St. Pierre made this recommendation for the times you find yourself enjoying a different type of beverage. Categories: Uncategorized | Tags: dehydration, fruit, hydration, tea, water | Permalink.